In the heart of the Central Okanagan Region of British Columbia, Canada, lies Okanagan Lake. This lake is home to a legendary sea monster similar to the Loch Ness Monster. For centuries, natives to this area have believed in and respected the great serpent, N'ha�a�itk, even offering it sacrifices at it's cave in Squally Point so that they may achieve safe passage across the lake in their canoes. 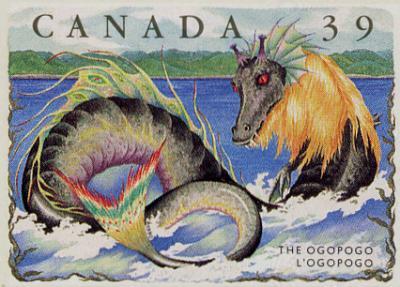 The best-known Canadian lake Monster, Ogopogo, made its media debut In 1926. It was witnessed by a large group of people at Okanagan Mission Beach. 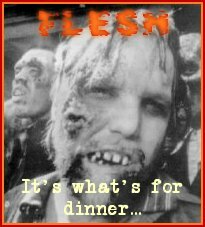 Roy W. Brown, editor of the Vancouver Sun, wrote, " Too many reputable people have seen [the monster] to ignore the seriousness of actual facts." 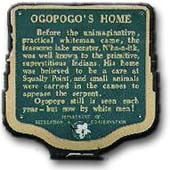 Indians referred to Ogopogo as N'HA-A-ITK which when translated means "Lake Demon". 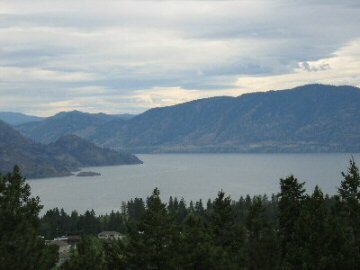 Legend explains that the creature was actually a demon-possessed man who had murdered a local known as Old Kan-He-K. (Lake Okanagan was named in his honor). As punishment, the native gods turned the murderer into the giant sea serpent so he would remain at the scene of the crime for all eternity. Hence Ogopogo's longevity. To appease the monster N'HA-A-ITK (Ogopogo), the Indians offered small animals at it's legendary lair/submarine caves off Squally Point near Rattlesnake Island. 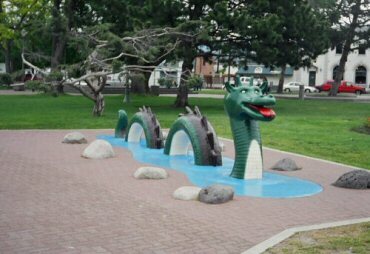 Ogopogo frequents the waters between his favorite island and Mission Valley and has made journeys to both ends of the lake. Recorded sightings date as far back as the early 1800's. In 1860, John McDougal lost his team of horses when they were pulled under as he was swimming them across the lake in a canoe....never to be seen again. 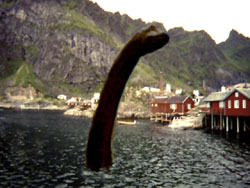 Ogopogo is dark green in color, estimated at one to two feet in diameter with a length ranging between 15 to 50 feet. Ogopogo's head is said to resemble that of a horse or goat head with a beard. 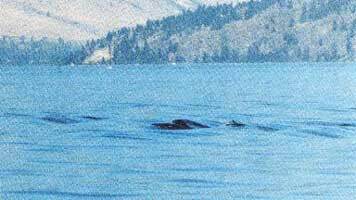 Ogopogo has been mistaken for a log, boat wake, large sturgeon and other floating mysteries. The government, in 1926 announced that the new ferry being built for travel across the Okanagan Lake would also be equipped with special "monster repelling devices."